LAPregnancy has tried out many carriers, baby slings, you name it but we found one that is not only wonderful to use but also met our stylish needs! 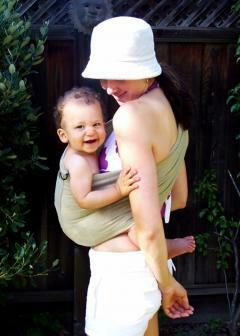 It's called The Peanut Shell and it's a a pouch style baby sling - no belts, buckles, straps here! It's so comfortable because the material stretches and the nice people at Goo-Ga say it's a "frazzle free baby carrier that offers you & your baby a pain free carry"... we wholeheartedly agree!